Awesome Moving Tunnel Optical Illusion! Holy warp speed, Spock! Have I got a fun optical illusion for you today! When I first saw this tunnel optical illusion, I had to double check that it wasn’t really moving, because it sure looks like it! Don’t believe me? Check it out! Crazy, no? This tunnel optical illusion is absolutely amazing! Well, I think so, anyway. Doesn’t it look like you’re heading down a tunnel and out of a spaceship? It almost feels like you’re traveling right out of the mother ship to go explore deep space! This tunnel optical illusion isn’t moving at all, though. It’s a still picture. If you don’t believe me, place you mouse pointer in one of the squares on the wall. 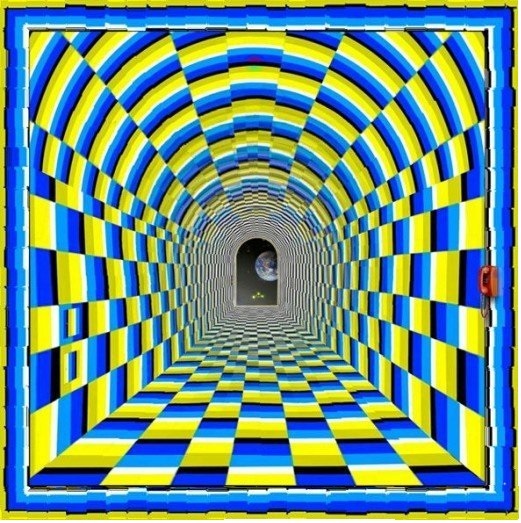 Wanna know why this tunnel optical illusion works? Check out this explanation of moving optical illusions! Prev What do You See First? Men or Pillars? Next I Will Now Read Your Mind With This Simple Card Trick!